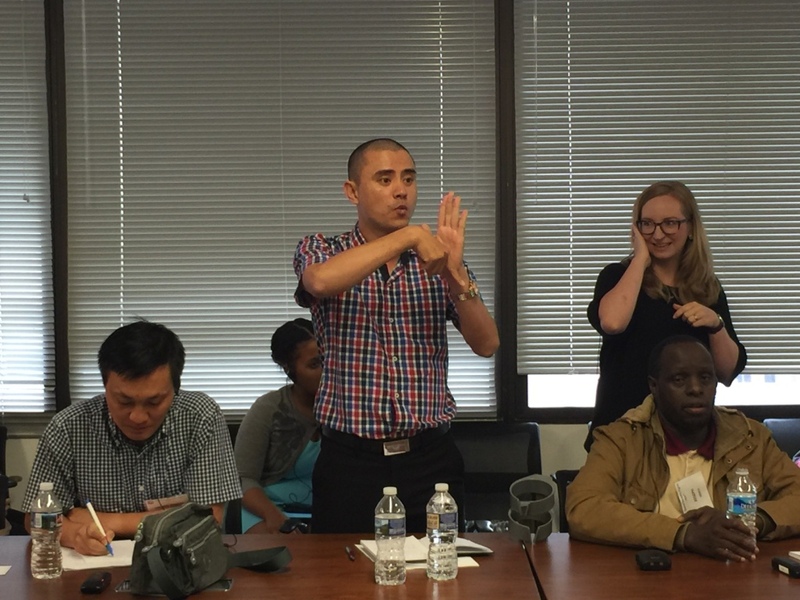 Developing a Certification Process for Sign Language Interpreters | Global Disability RightsNow! Lobby officials and pursue legal action to ensure that credentialed interpreters are required by law in any place of public accommodation, such as businesses open to the public. Search for influential advocates to promote the cause, such as judges, governing officers, and legislators. Push for funding mandates both before and after the law is passed with clear criteria for all costs associated with interpreting, including both the funds for paying for interpreter services as well as implementing the law and staffing the programs. In the U.S., the majority of mandated payments fall into four categories: Interpreter Services, Jury Payments, Arbitrators, and ADA Compliance. Collaborate with organizations who share similar goals to combine resources and avoid repetitive efforts. The National Center for State Courts (NCSC) model, an independent collaboration that provides research and education to state courts, is a good example of this within the U.S.
Executive Order 13166: Improving Access to Services for Persons with Limited English Proficiency (LEP). Title VI of the Civil Rights Act of 1964: Prohibits discrimination on the basis of race, color, or national origin in any program that receives federal funding. The Omnibus Crime Control and Safe Streets Act of 1968: Obligation to ensure effective communication with LEP persons by providing competent language services at the state's expense. Visit www.lep.gov for more information on federal laws. See below for additional resources on interpreter certification and education in the U.S. and elsewhere. Language Access in California - (Available in Spanish, English, and Vietnamese) Plan for language access in California state courts. Commission on Collegiate Interpreter Education - Standards for establishing sign language interpreter education programs. American Sign Language Teachers' Association - Promotes good quality instruction in American Sign Language (ASL) and for certification of ASL teachers.